Do you have questions? Of course you do! Choosing a venue is THE most important thing next to choosing the right partner and we'll be there every step of the way to help make this part of wedding planning as stress free as possible. 1. Is there a set venue fee and are there days/months that are less expensive? 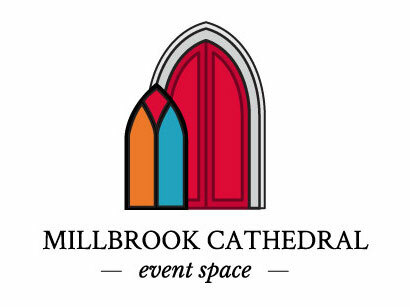 Millbrook Cathedral offers a discount for booking in off-season months, and days other than Saturdays - so be open to alternatives if you are looking to save. 2. How many people can Millbrook Cathedral accommodate? The official capacity number is 140. 3. What’s included in the venue fee? Exclusive use of the premises (no sharing! ), use of bride & groom dressing room, indoor or outdoor ceremony, the Millbrook Lounge and in-house planning services. 4. How many hours does the rental fee include, and is there an overtime fee if I stay longer? Typically the rental period is from 3pm - 1am. More time can be purchased so please ask your venue manager. 5. How much is the deposit, when is it due, and is it refundable? A non-refundable deposit of $2500 is required to hold your date. 6. What’s the payment plan for the entire bill? What forms of payment do you accept? Deposit by etransfer and the follow up payments by check. Sixty days before your wedding we’ll need 50% of the total wedding estimate (catering and rentals), and at 30 days the second 50% minus the deposit already paid. 7. Can I have my ceremony here, too? Is there an additional cost? Ceremony is included in all full service weddings but you can book a ceremony only event. 8. Are there changing areas for the bride, groom, and/or wedding party? YES! We have both a bride and a groom’s room. 9. Can we have our rehearsal dinner here? What about a morning-after mimosa brunch? We can arrange parties for all kinds of pre- and post wedding events as well. 10. How much time is allocated for the rehearsal? 11. What’s the cancellation policy? Deposits are non-refundable and the 60 day payment may be partially refundable depending on how far in advance you cancel. Once the 30 day payment is made that partial refund will shrink even more. 12. What’s your weather contingency (backup) plan for outdoor spaces? Since we do ceremonies both indoor & outdoor this is covered! Yes we do however it is required that you get your own policy. Your venue manager can help with that. 14. Do you have an in-house caterer or a list of "preferred" caterers, or do I need to provide my own? Even if there is an in-house caterer, do I have the option of using an outside caterer instead? Millbrook Cathedral has a preferred caterer, Hawley Crescent Culinary that we have chosen based on the quality and beauty of their food. To ensure you have the best experience we only wanted to partner with a caterer we can stand behind 100%. Hawley Crescent also accommodates dietary restrictions and/or food allergies. In some special circumstances an outside caterer will be allowed however there will be fees associated. 15. Is there a food & beverage minimum? 16. What’s the tax and service charge? 17. Can we do a food tasting before we finalize our menu selection? Does it cost extra? If you have already booked your wedding with us, your tasting for 2 is included. If not the cost is $25 per person put towards your catering bill when you do book. 18. Are tables, linens, chairs, plates, silverware, and glassware provided? We have a wide selection furniture to add to your package that you will order with the help of your venue manager. Tableware is always included. 19. Can I bring in a cake from an outside baker or do I have to use a cake made on site? Yes, please order your cake on your own or we’ll help you with that. 20. Is there a cake-cutting fee? Cake cutting is included in some packages, in others it’s an upgrade. 21. Can we bring our own wine, beer or champagne? What about hard liquor? If you order the BYO bar package then you will decide how to stock your bar. 22. Is there a charge for the bartender? 23. Are you licensed to provide alcohol service? We only use Smart Serve bartenders and that together with your SOP gives you the permission to serve alcohol. 24. How much is an open bar? For a full service bar it will cost $48/per adult and includes everything needed to run a bar from garnishes to glasses. 25. Are there additional charges for bar staff in a full service package? 26. Are we allowed to bring in our own decorations? Yes, with some restrictions - no holes allowed - no fire allowed. 27. Do you have an inventory of décor we can borrow from? We have uplighting you can rent and plenty of couches and tables you can use. 28. Can I move things around or do I have to leave everything as is? Things can be moved with the assistance of your venue manager. 29.Can we use candles/confetti/sparklers/fireworks/animals/lawn games/bounce houses/food trucks/insert your own fun-but- potentially-dangerous liability here? With the permission of your venue manager some out of the box ideas can be accommodated. 29. Do you have signage or other aids to direct guests to my event? 30. Do you provide heaters and/or umbrellas for the outdoor spaces? Not at this time but we can arrange your rentals if needed. 31. Can I hire my own vendors or is there a preferred vendor list we need to stick to? With the exception of the caterer and tables/chairs you can hire who you want. 32. Do you offer on-site coordination? What services are excluded? Yes we do. Exclusions include setting up decor from outside vendors and post dinner coordination. 33. Can the venue accommodate a DJ or live band? We can accommodate both, we have 2 stages! 34, What security services do you offer? Security is not included but can be arranged. 35. Do you provide a coat check service? The coat check is self-service but staff will be there to assist. 36. What time can my vendors start setting up on the day of the wedding? Speak to your venue manager about what’s required and we’ll make the arrangements. 37. Does the venue provide assistance getting gifts and/or décor back to a designated car or hotel room after the wedding? No, but you can hire our venue coordinator for extended service to handle this. 38. Is there a separate space for cocktail hour? 39. How many restrooms are there? 40. What overnight accommodations do you provide? There is a luxury B&B a few doors down and lot of unique AirBnBs close by but no on-site accommodations. 41. What are the nearest hotels to the venue? There are plenty of hotels 15 minutes away that we can arrange for you. 42. Who makes up the schedule for the day? Our venue manager will create a schedule for the day along with your planner if you have one. 43. Do you have a sound system and/or microphones for speeches? 44. Are there any noise restrictions? Respect our neighbours - no loud music outdoors. 45. Is there parking on site and if so, is it complimentary? If not, where will my guests park? Yes there is parking onsite. We also have overflow parking if needed. 46. If a shuttle service is needed, can you assist with setting it up? Definitely. It’s our preference that your guests don’t drive.